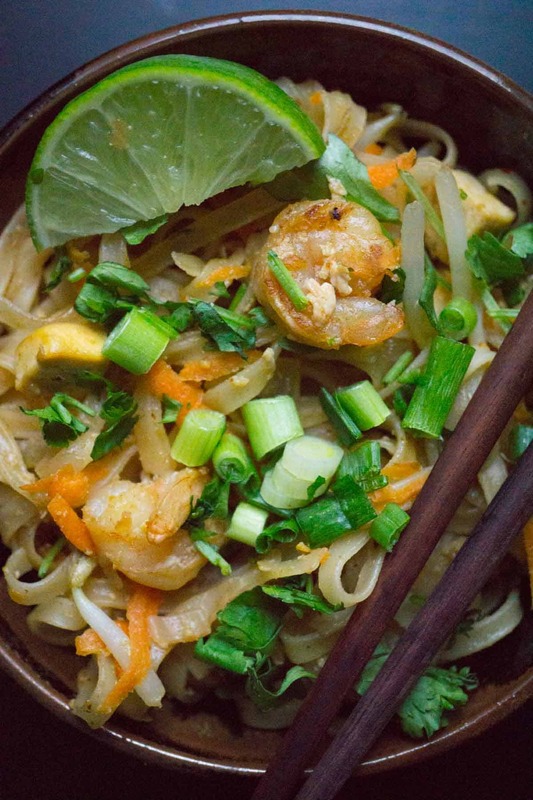 This one pan Pad Thai is so easy, you’ll question ever ordering out for Thai again. It’s far tastier than any Pad Thai dish I’ve had outside of Asia. One of the biggest drawbacks of living up north is the loss of daylight. The time change for daylight savings is the worst. 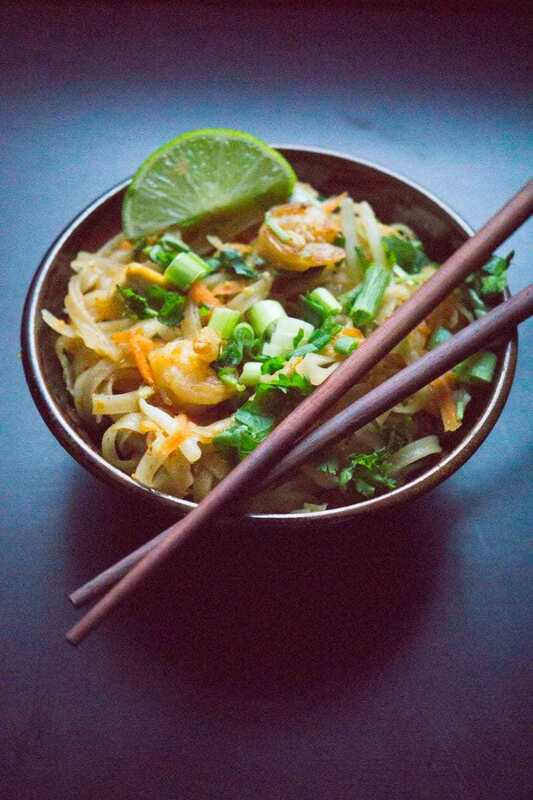 I made this Pad Thai for dinner today…. at 3:30 PM. I suddenly realized that if I wanted to photograph it in natural light I’d have to hurry my booty up and start making dinner two hours earlier than usual. And the photos STILL turned out dark! So the photos aren’t the greatest, but the recipe is! 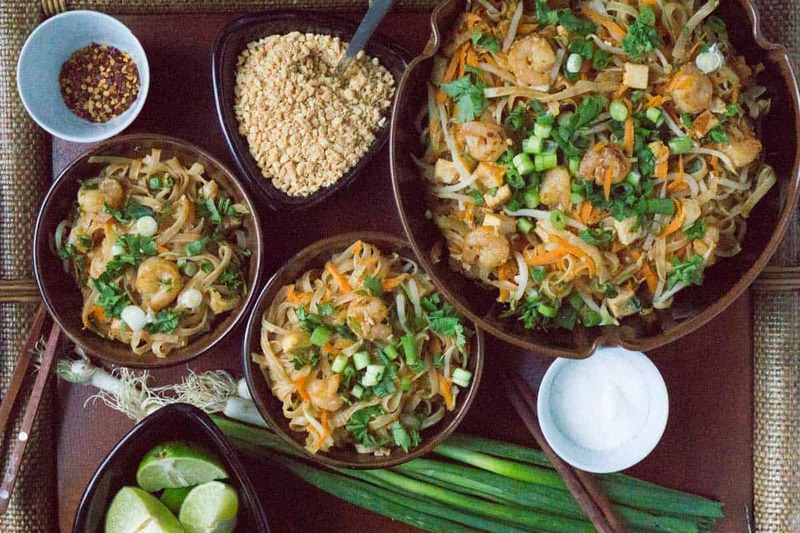 This Pad Thai is so easy, you’ll question ever ordering out for Thai again. It’s far tastier than any Pad Thai dish I’ve had outside of Asia. The Thai restaurants in Canada just don’t seem to know how to do it right. One summer, my friend and I traveled/volunteered our way through South East Asia. We ate Pad Thai nearly every single day. You can’t argue with a $.50 meal! We also took a cooking class, which was a ton of fun, but it was disappointing to come home and realize most of the key ingredients were unavailable in our city. Kefir lime, galangal, Thai basil…. no one carries those around here! The only dish I could make was Pad Thai. I’ve “Dietitianed” the original recipe slightly by adding more veggies and making some other alterations, but it still tastes incredibly authentic. When I tasted my creation I was transported back to the streets of Chiang Mai. My preference is to add a small squeeze of lime and a few scoops of peanuts. 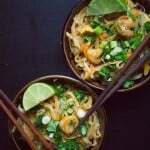 The recipe includes shrimp, pork, or chicken, but it’s more of an accent than the main feature. This is one way to enjoy meat, while cutting down on your intake. It’s still a very balanced meal, because the ingredients also include tofu, eggs, and peanuts, which are all vegetarian sources of iron and protein. In a wok or large skillet, heat the oils over medium. 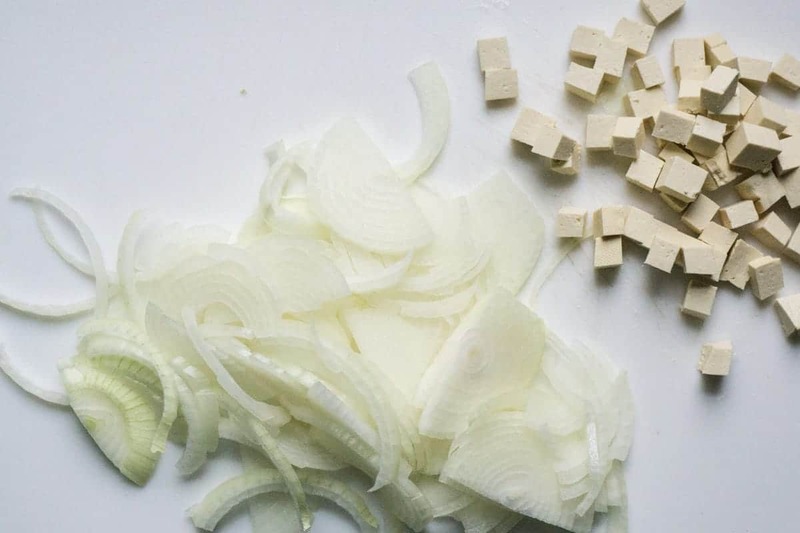 When hot, add the onions, tofu, garlic, and chili flakes. Cook until the onions are soft. Add the shrimp (or chicken or pork). Stir fry until fully cooked. Add the egg and stir fry until the egg is cooked. Add the sugar, fish sauce, oyster sauce, noodles, and 1 ½ cups of water. Cover. Open and stir every minute or so. Try to press the noodles into the water in order for them to soften and cook. Once the noodles are soft add in the carrot and bean sprouts. Stir to combine. Serve with fresh cut limes for squeezing, chopped peanuts, extra chili flakes for those who want more spice, and sugar for those who like it sweeter. If you’re a vegetarian that’s okay with fish and oyster sauce, feel free to increase the tofu to 350g and skip the shrimp/chicken/pork! I want this right now… but so many ingredients I don’t have 🙁 I’ll put them on the list for next week’s shopping trip. Great blog! I love so many of your recipes already. Glad I stumbled across it. Thanks so much Kate! I’m glad you’re enjoying the recipes. If you subscribe to the newsletter I’ll send you all the new ones as I come out with them! What is 200 grams in cups or lbs?? 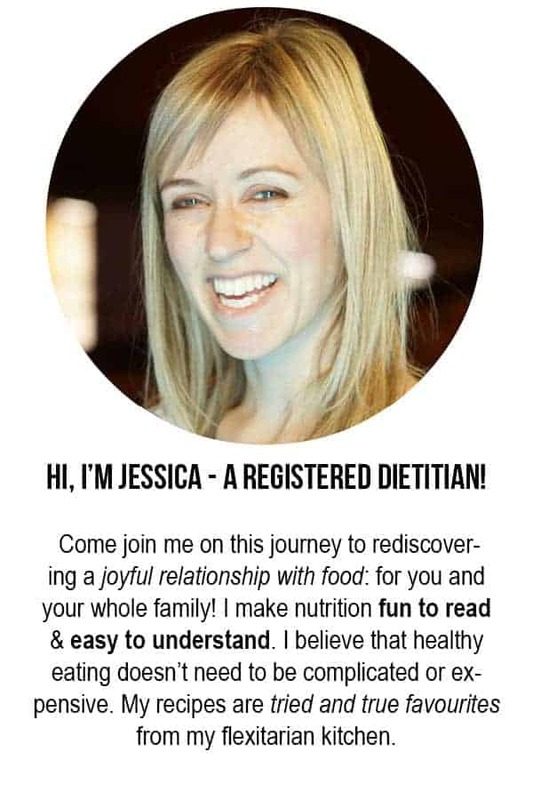 Please include these conversions and not just grams — I wish I had your dietician knowledge but I need simple! Looks wonderful. Haha 🙂 I’ll do my best to remember to include both metric and imperial! 200g is just shy of half a lb. Or 7 oz. The amount of beans sprouts doesn’t need to be precise. In cups, I’d say about 3 cups if I had to guess! Forgive my cooking ignorance, but do you beat the egg before you add it or do you crack it into the pan and sort of swirl it around? I made this tonight and my husband and I were SO happy! Just delish! Fresh and as good as my favorite Thai cafe. Thanks so much. Awesome! Doesn’t it feel so good when you can make your favourite restaurant food at home? made it, loved it and my picky 18 yr old LOVED it. Will definitely will make again!! Awesome! Thanks for the review. Hi Jessica! Very excited to make this, but I did have one question. I have a pretty big wok, but it didn’t come with a lid. Will it be an issue if I can’t cover it while the noodles and other ingredients cook? Thanks! I imagine it will still work but that it would take a bit longer for the noodles to cook. Make sure to watch it and add more liquid if necessary! Also, do you have any large pot lids? Even if the lid didn’t cover the whole wok, you could probably cover up most of the ingredients. Let me know how it turns out!